You can replace the farro with other grains such as barley, oats or quinoa; boiled wild rice is great, too. Wake up your taste buds by roasting spices like fennel, coriander and cumin seeds, then crush and sprinkle over salads like this one. I also like to barbecue a couple of hot chillies, then crush them into the salad. Simmer the farro for about 15 minutes in salted boiling water - you still need a good bite to it. Drain and dry. Put the farro in a bowl and add the parsley, mint, red onion, spring onions and vine-ripened tomatoes. Mix well. Whisk the olive oil and lemon juice together and season to taste with salt and pepper. Add the dressing to the farro and mix through thoroughly. Place a pan onto the stove on a high heat and add a splash of extra virgin olive oil. When hot, add the haloumi slices and cook on one side for a minute until they turn brown and a crust forms. 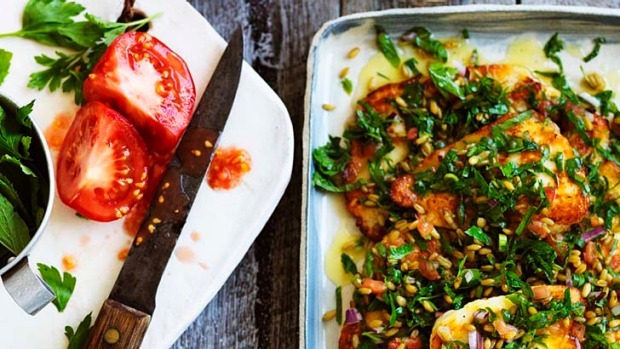 TO SERVE, slice up the haloumi, divide between 4 plates and spoon over the farro salad.